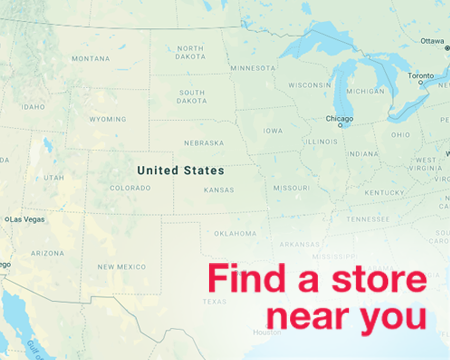 For most of us, the closest we’ll ever get to tigers, zebras and giraffes is at the zoo. 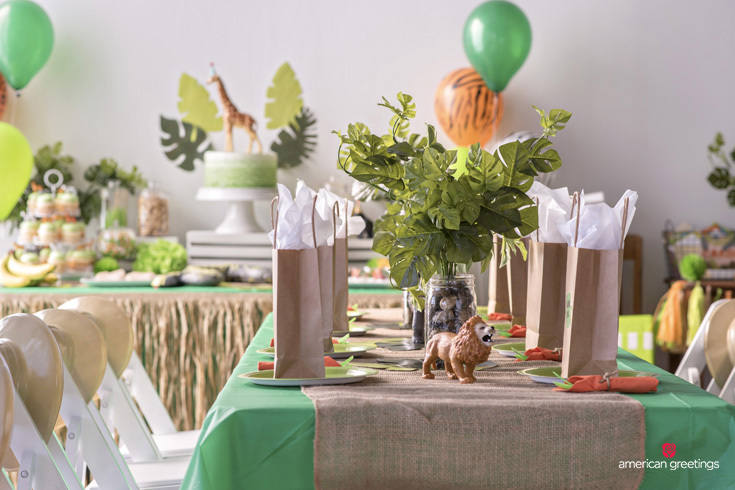 But with a little imagination and these helpful jungle party ideas, you can easily make a safari adventure come to life in your own home. 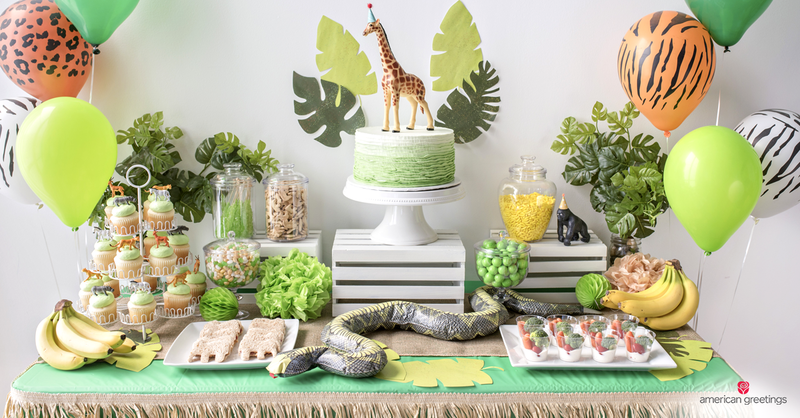 These are our favorite budget-friendly tips and tricks for a fun and memorable jungle-themed party. 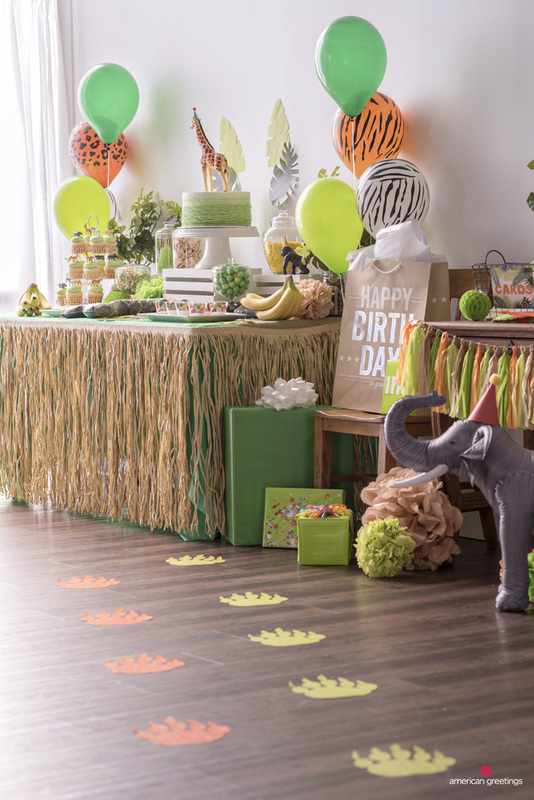 Gather your party animals and get ready for a wild time! 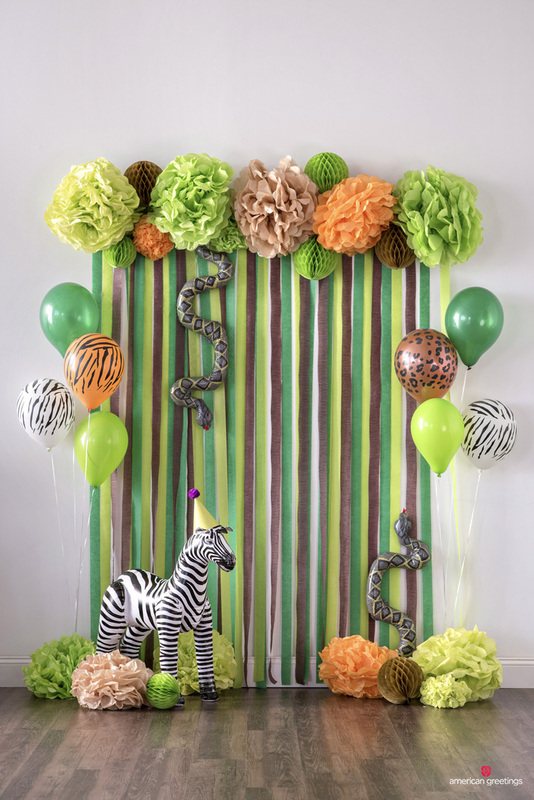 Using our jungle party color theme of greens with pops of orange, gold and brown, we made a photo-worthy backdrop by hanging strands of crepe paper in kiwi, festive green and brown. 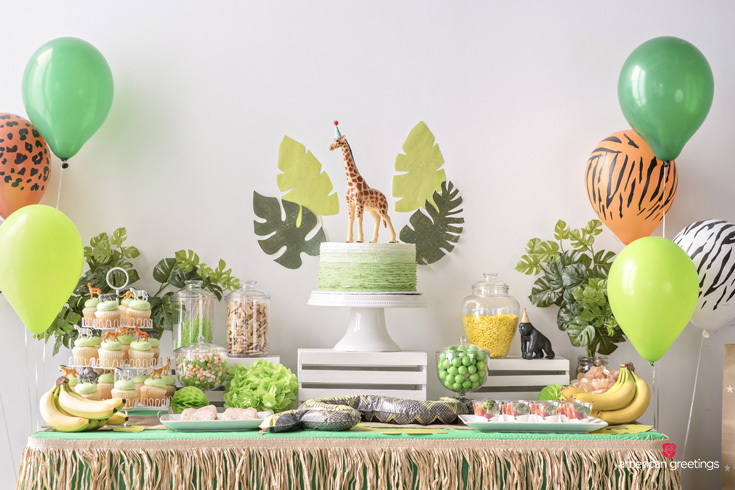 We then pulled the look together with honeycomb balls and tissue paper pom-poms in kiwi, orange and gold to add color and texture. Let’s not forget the party animals! 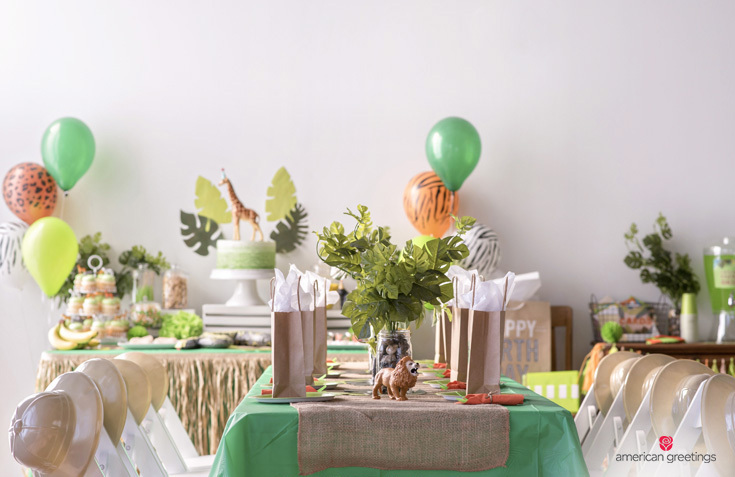 Inflatable animals make great photo props for your guests, and their handmade party hats give a potentially ferocious friend a much more approachable appearance. 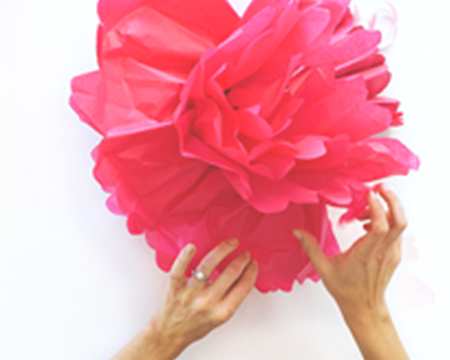 We made their hats using scrapbook paper topped with a hot-glued pom-pom. 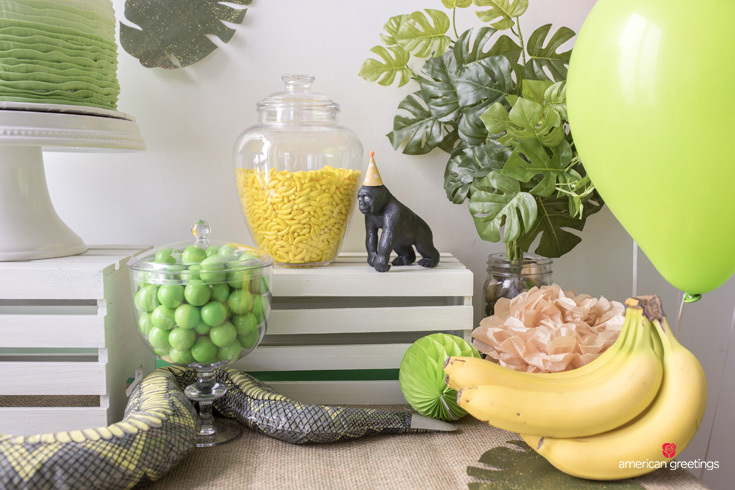 To add both height and a festive feel to your party’s décor, use balloons in the party’s color scheme and anchor them at various levels throughout the room. 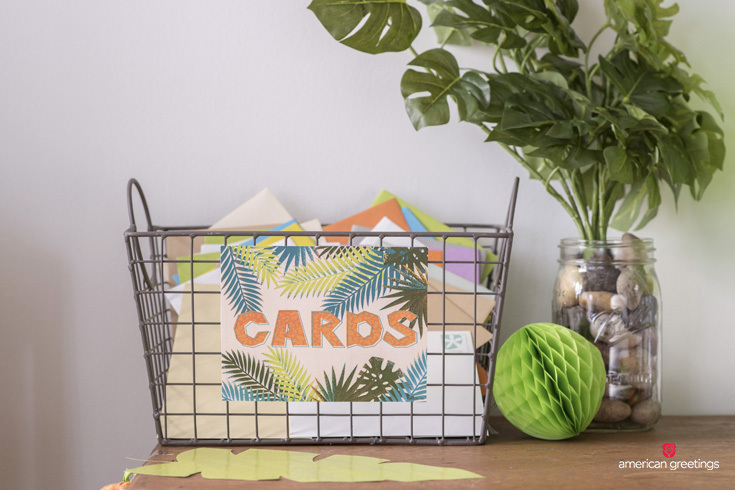 Card baskets not only tell your guests where to put their cards, but they also give your card and gift table more prominence. Choose your favorite basket and use it for every party you host. 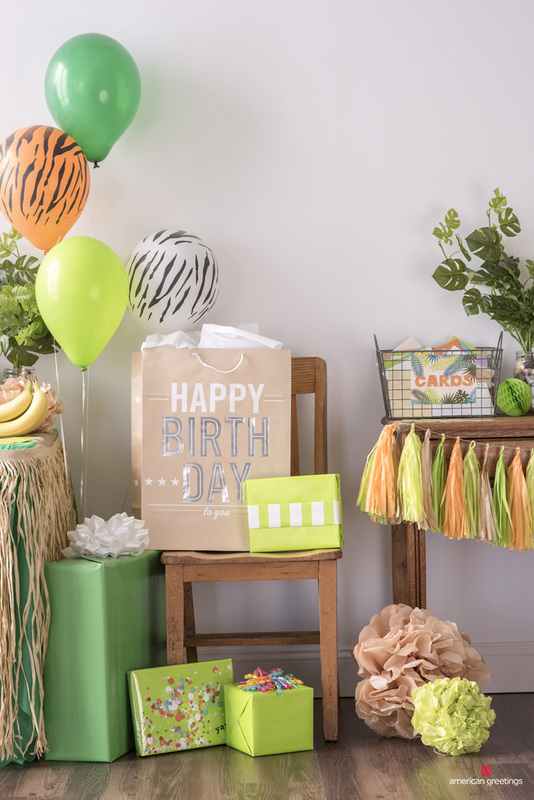 This free printable perfectly fits the jungle theme and is meant to be adhered to your card basket. 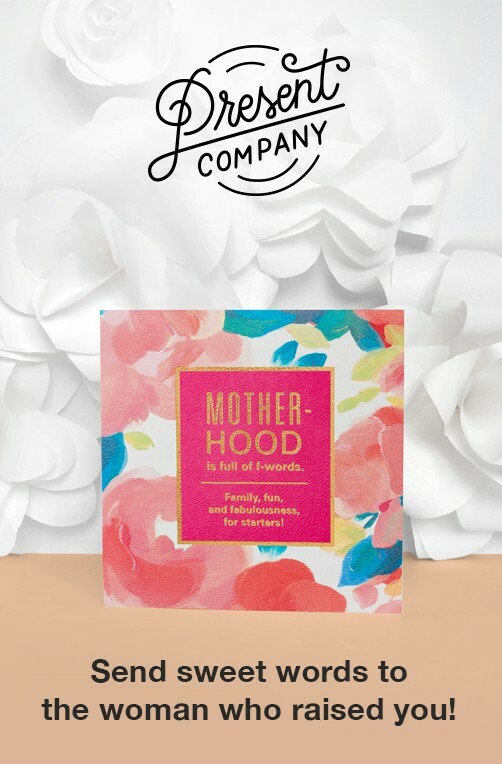 We recommend putting the card table and gift area within sight of the entrance so guests can easily find it when they arrive. But if that’s not possible, have the animals lend a foot (or two). 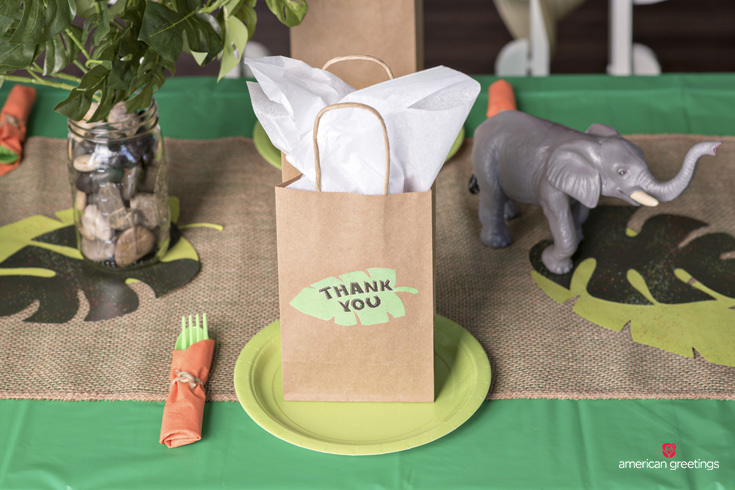 Our free printable footprints can be placed on the floor to help guide your guests to the gifts. 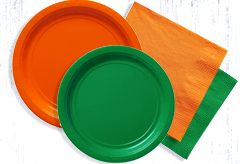 Plus, they’re available in a variety of sizes and colors to match your party’s theme. 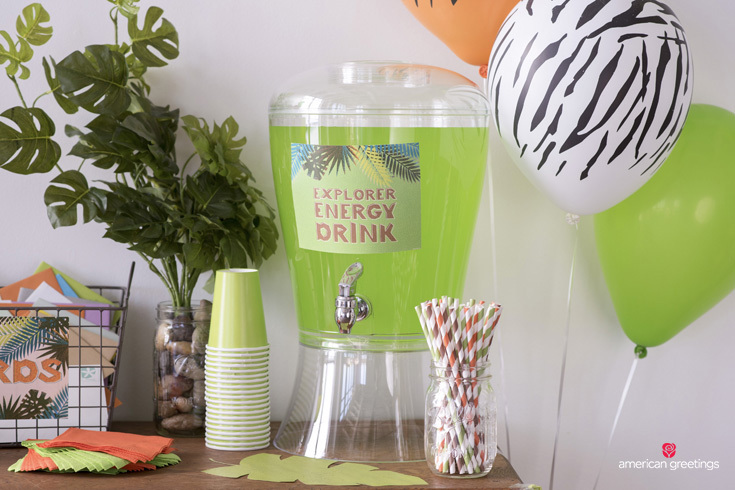 Our free printable leaf serves as both a decoration and a spill-catcher under the beverage dispenser. 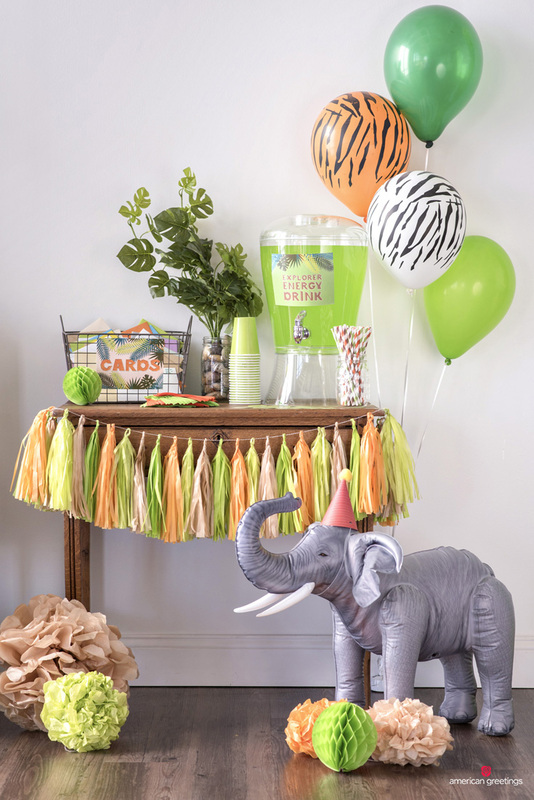 To complete the beverage station, include a mason jar of paper straws and fan out napkins in kiwi and orange to complement the paper cups. 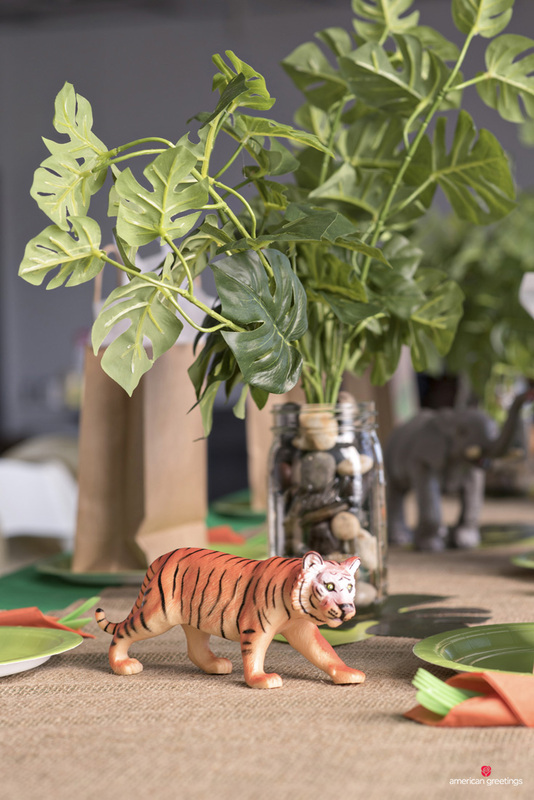 As an added touch, we filled a larger mason jar with river rocks and a cluster of jungle leaves to bring the jungle theme to life. 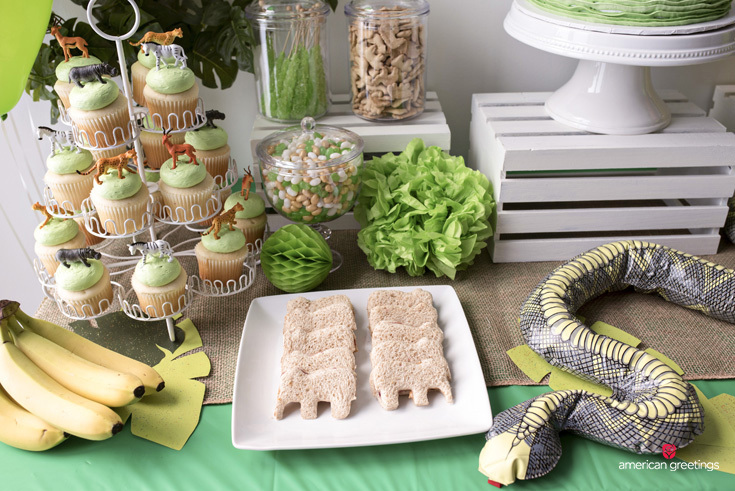 We didn’t monkey around when it came to the food table. Little herbivores will love these snack-sized veggie cups with ranch dressing, broccoli and baby carrots. Mix it up with an assortment of veggies for a healthy, kid-approved snack. To add dimension on both the table and the wall, we incorporated in coordinating colors. 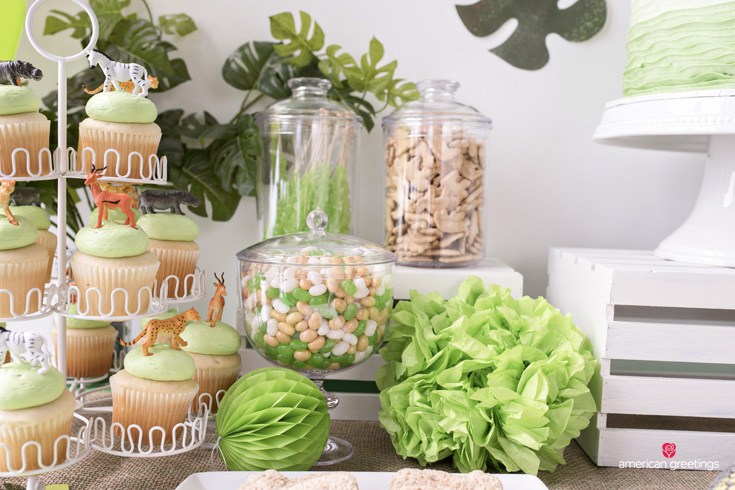 Wooden crates serve as pedestals for the snack and candy jars, which are filled with jungle themed treats including animal crackers, green rock candy, gumballs, and banana-shaped candies. We also used an elephant-shaped cookie cutter to make these fun mini PB&J sandwiches. (Tip: It’s much easier to cut the bread BEFORE assembling the sandwich.) 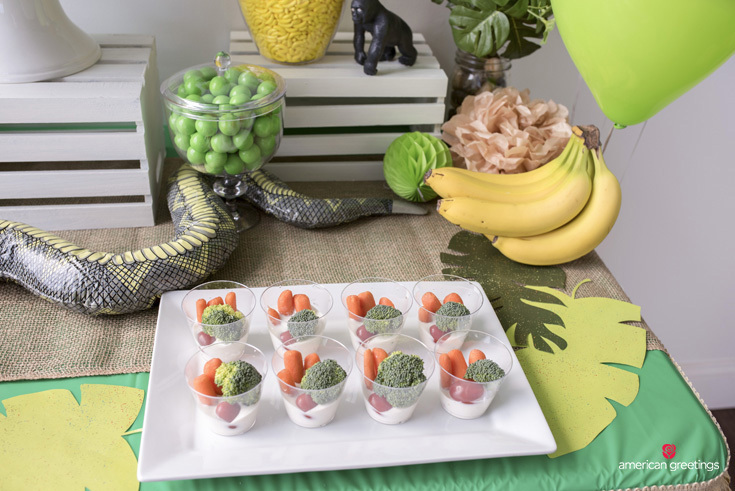 Bananas also make easy-to-grab snacks and are perfect for your jungle party décor. 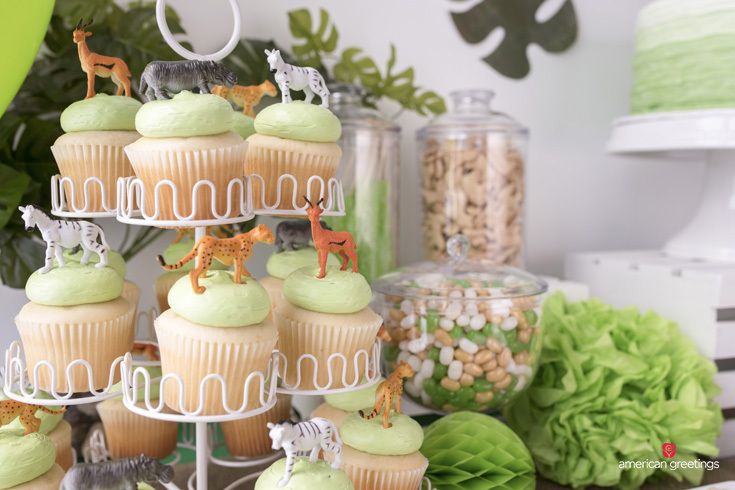 A birthday celebration calls for cake and cupcakes, so we made delicious sweets topped with jungle animal toys. 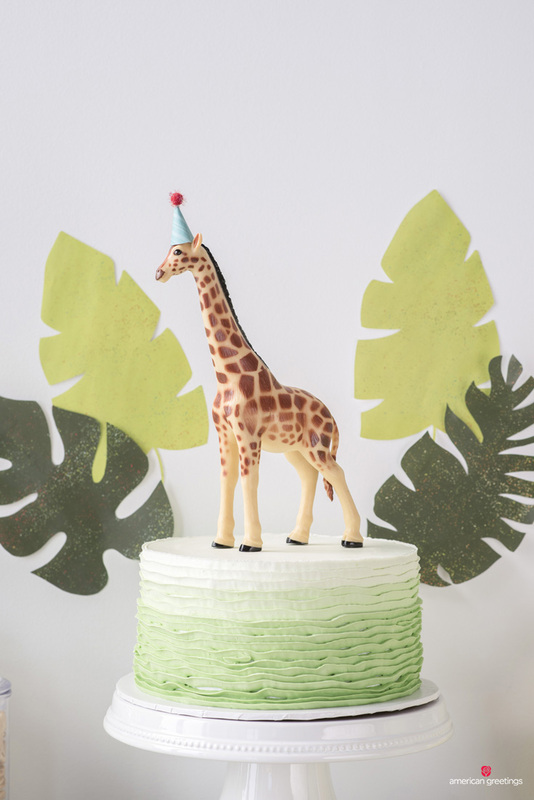 If you choose to use a non-food safe cake topper, it’s a good idea to coat any part of it that touches the cake with a food safe barrier. We started creating our dining table using a green plastic tablecloth with a burlap runner. 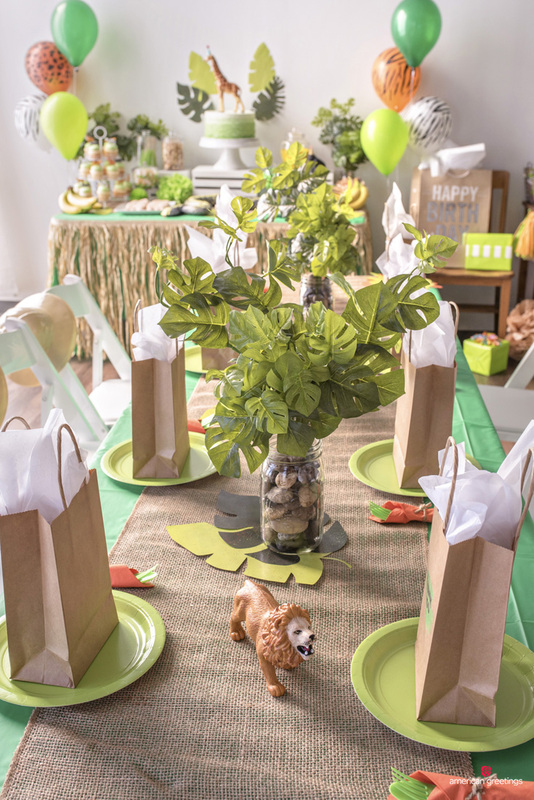 We like to use our kiwi green table decorations to help make the table decorations pop! 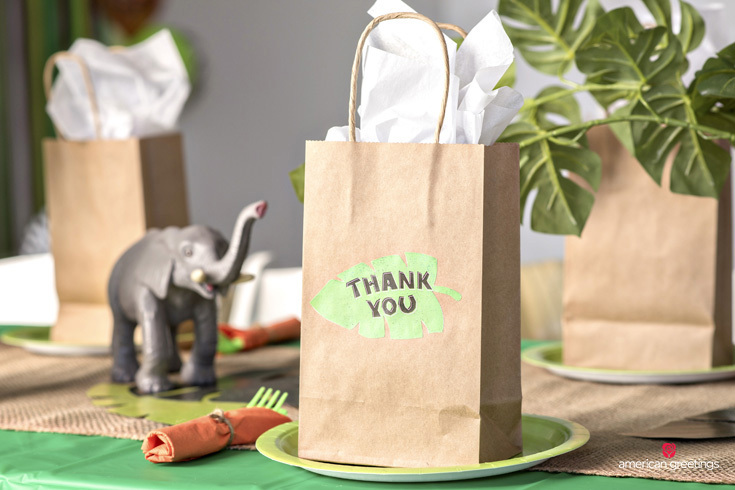 Simple gift bags can be turned into thoughtful “thank you” notes for each party-goer. Just use these printables on full-sheet sticker paper and adhere to every bag. You can also print on regular paper, cut out the leaves, and glue them. 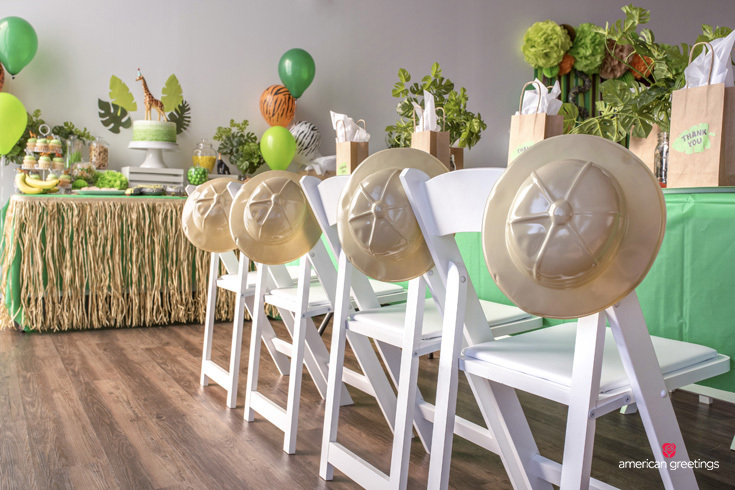 Every little adventurer should look the part, which is why we included these plastic safari hats that we ordered on Amazon, as party favors. Place one on the corner of each chair and encourage your guests to pose in front of the backdrop for the perfect photo op. 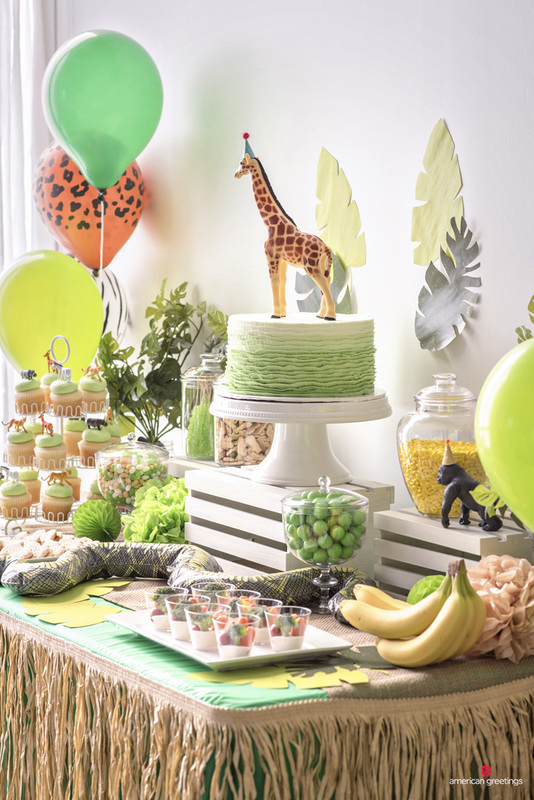 And there you have it — a party as mighty as the jungle itself (that won’t cost you an arm and a leg)!